A NEW art exhibition showcasing work by those who have experienced homelessness has opened at the Lightbox gallery and museum. 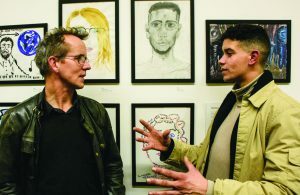 Woking-based homeless charity York Road Project is behind the exhibition called Don’t Stereotype, and all of the exhibited artwork is by contributors who have been actively rough sleeping or have been clients of the charity. York Road Project is tackling the complex reasons behind the causes of homelessness, and working to challenge pre-conceived ideas about rough sleeping – and the charity has been exploring this through artwork. John Santos had nowhere to live and was a rough sleeper in the town, but after being encouraged to attend a painting workshop he found that his natural skills stimulated him to think creatively and develop his imagination. “I wanted to do it, and I loved it,” he said. Internationally renowned sculptor Shaun Henry, who was born in Woking and whose sculptures adorn the town centre, was on hand and he assessed the exhibition: “I think it’s a really impressive group of individual artists and the work they do comes across as verbal communication and very direct self-portraits,” he said. The exhibition, which runs for two months, demonstrates that the streets of Woking are home to gifted artists.